LGBT groups have condemned anti-transgender leaflets that were distributed to fans at the women’s FA Cup Final this weekend. Fans attending the Arsenal v Chelsea game at Wembley Stadium were handed leaflets by activists from ‘Mayday4Women’, a group that campaigns against transgender rights. The leaflets urge fans to support calls for a ban on transgender women – referred to in the leaflets as “male-bodied athletes”. The leaflets, which are believed to have been distributed outside the stadium, read: “Women have fought very hard over the past century to get their own recognition of their athletic values and have a place on their own in sports. The leaflets have been condemned by LGBT groups who work to challenge homophobia and transphobia in sport. Lindsay England of Just A Ball Game? 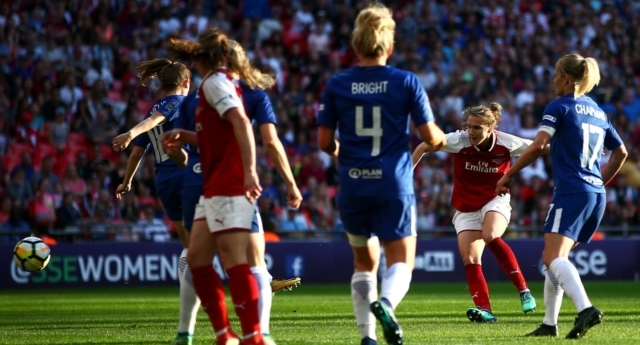 told PinkNews: “[We condemn] the hurtful and disrespectful leaflets handed out at Wembley Stadium during the 2018 SSE Women’s FA Cup Final. A spokesperson for Pride in Football told PinkNews: “We are concerned that transphobic hate literature was distributed at Wembley for the Women’s Cup Final and have asked the FA to let us know a) whether stewards and police were aware and b) if any action was taken. “We, along with LGBT+ fan groups Gay Gooners and Chelsea Pride, encourage anyone who has any information to contact Kick it Out, who will liaise with the Met Police. The FA did not immediately return a request for comment. There are zero openly transgender players in the top tiers of football in the UK, either in the men’s or women’s league. Transgender sports stars who have participated in other sports, including Aussie rules footballer Hannah Mouncey and transgender weightlifter Laurel Hubbard, have suffered horrendous abuse for doing so. Most athletic bodies only allow transgender women to compete in women’s sport if they have a level of testosterone equivalent to that of cisgender women.